Courtesy of Windermere Central Or.R.E.Redm. 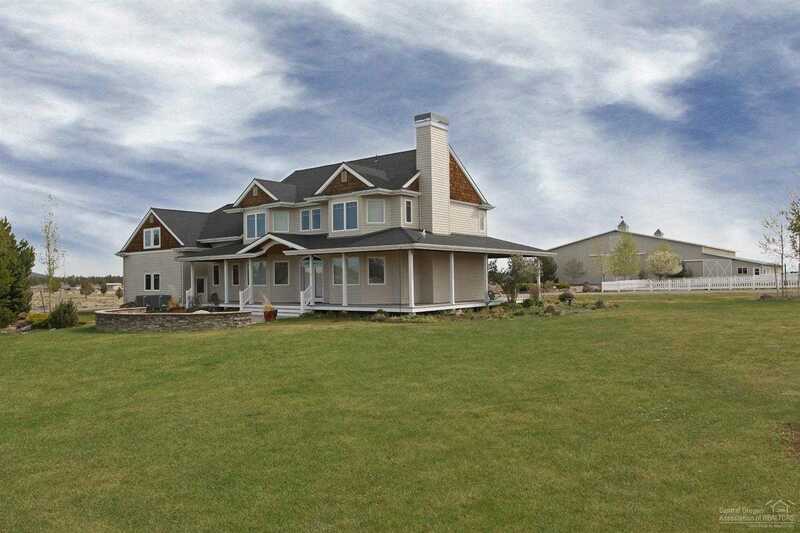 31.65 Acres Equestrian property in Tumalo with gorgeous Cascade Mountain Views. Electronic gate and vinyl fencing greet you as you enter this property, featuring a 4+ Bedroom, Custom home with wrap around porch. (Home was remodeled in 2014) 20 Acres of Irrigation currently in Grass Hay Crop. 2 Ponds, 18 x 24 Loafing Shed with Power. Acreage is fenced and cross fenced. All irrigation equipment is included. 10,000 sf Arena/Barn/Tack building with 3 finished stalls (room for add’l stalls). Arena area is 80 x 95 with lighting. Please, send me more information on this property: MLS# 201811314 – $1,380,000 – 66290 Cline Falls Road, Bend, OR 97703. I would like to schedule a private showing for this property: MLS# 201811314 – $1,380,000 – 66290 Cline Falls Road, Bend, OR 97703. The content relating to real estate for sale on this website comes in part from the MLS of Central Oregon. Real estate listings held by other Brokerages are marked with the Reciprocity logo, and detailed information about these properties includes the name of the listing Brokerage. Copyright MLS of Central Oregon (MLSCO). Some properties which appear for sale on this website may subsequently have sold or may no longer be available. All information provided is deemed reliable but is not guaranteed and should be independently verified. All content displayed on this website is restricted to personal, non-commercial use, and only for ascertaining information regarding real property for sale. The consumer will not copy, retransmit nor redistribute any of the content from this website. The consumer is reminded that all listing content provided by automatic transmission by MLSCO is copyright of Multiple Listing of Central Oregon (MLSCO). © 2019 Cate Cushman — Bend Premier Real Estate. All Rights Reserved. Real Estate Website Design powered by Home Junction.